We have a lot of customers, and we have a lot of research into our installed base. We also watch industry trends pretty carefully. But in the end, for something this complicated, it's really hard to design products by focus groups. A lot of times, people don't know what they want until you show it to them. That's why a lot of people at Apple get paid a lot of money, because they're supposed to be on top of these things. Steve Jobs was talking about personal computers, but he could well have been talking about classical music. Classical music is complicated, and it stubbornly resists being rationalised by focus groups and the other fashionable tools of the marketing industry. But the big difference between Apple and classical music is that in Cupertino there are a lot of people who are on top of things, but in classical music central there are a lot of people who are paid to be on top of things, but aren't. The music of Alan Hovhaness provides an enlightening case study. Classical music is desperate to attract new audiences, and also needs to widen the tastes of its existing audience. 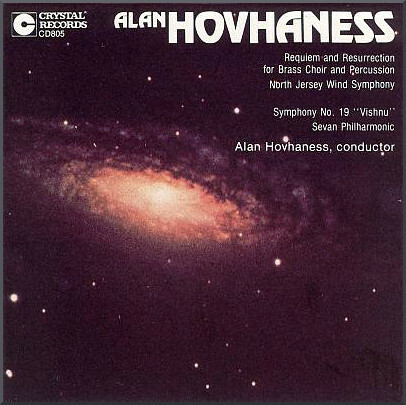 In a sleeve note for an album that coupled Alan Hovhaness' Mysterious Mountain (Symphony No 2) with Lou Harrison's Elegiac Symphony, Tim Page enthused that: "Here is beautiful music - straightforward, deeply felt, expertly made yet far removed from deliberate cleverness, serene, affirmative, even holy". Hovhaness wrote sixty-seven numbered symphonies which overflow with straightforward and beautiful music. Yet, to give just one example of his lamentable neglect, not a single note of his orchestral music has ever been performed at the BBC Proms. Squeezed out no doubt by the BBC's ongoing obsession with Mahler; an obsession that resulted in two Mahler symphonies being broadcast on Radio 3 recently within the space of five hours. Alan Hovhaness' music may often be beautiful, but it can also be challenging. He moved in the same circles as John Cage, and Cage expressed admiration for his music. In what is arguably his finest work, the Symphony No. 19 'Vishnu', Hovhaness uses aleatory sounds to represent the controlled chaos of our solar system. The symphony is subtitled Vishnu, because in Indian mythology Vishnu is the deity who presides over universes, infinite worlds and endless solar systems - hence J. Robert Oppenheimer's famous Vishnu quote from the Bhagavad-Gita: "I am become death, the destroyer of worlds". The power of Alan Hovhaness' music to engage was illustrated by its use in Carl Sagan's popular TV series Cosmos. An excellent recording of the Vishnu Symphony conducted by the composer dating from the early 1970s* is available on Crystal Records. Steve Jobs was quite right when he said people don't know what they want until you show it to them. When will a celebrity conductor emerge who has the courage to show people what they want by swapping just a little of the biblical flood of Mahler for some holy Hovhaness? You've read my point of view: now judge for yourself via this link. * The orchestra on the commendably full-bodied Crystal Records CD transfer is identified as the 'Sevan Philharmonic. Lake Sevan is the largest lake in Hovhanes' native Armenia. No recording details are given; my guess is the Sevan Orchestra are London session players, and the acoustic sounds like Walthamstow Town hall. No review samples used in this post. Any copyrighted material is included as "fair use" for critical analysis only, and will be removed at the request of copyright owner(s). Also on Facebook and Twitter. The neglect of Hovhaness is even stranger given the contemporary fad for "completism". If a conductor/orchestra programmes Mahler, Bruckner, Beethoven, Sibelius et al then there is an implicit assumption that they will perform a complete cycle of the symphonies, regardless of whether the conductor feels a need to do so. With 67 symphonies, surely Hovhaness is a programmers' dream. It is a sign of the way things have changed. Klemperer was devoted to the music of Mahler but there were symphonies that he never conducted. In a similar vein, I don't think Richter was a completist - I don't think he performed all the Mozart concertos or Schubert sonatas...I don't think he ever played the complete Chopin Preludes or Liszt Transcendental Studies, but don't quote me. Both musicians only played what they wanted or needed to play and discarded music that did not speak to them. And of course Klemperer was very active in the 1920s avant-garde in Germany - very much viewed as a contemporary music conductor at that time, despite the image we have of the gnarled octogenarian playing Beethoven and Wagner. The current completist fad is very annoying - why is the Wigmore Hall cramming its schedules over the next 2 years with the complete songs of Schubert and chamber music of Mozart? It seems like madness to me. When will we ever hear Arnold, Rubbra, Bax at the BBC Proms? Can we trade yet another Mahler 5 for Arnold 5 or Hovhaness 5?